This wintertime food pop-up organized by South Waterfront Community Relations was held on December 13th, 2018 at Osprey Apartments. The free and cozy culinary affair featured several vendors from the South Waterfront Farmers Market including: Crooked Furrow Farm, The Hummus Stop, 2 Towns Cider, How Sweet It Is, Kiyokawa Family Orchards, and Mixteca. Knife sharpening guru Gabriel Bell of Dragonfly Forge was also there to get attendees’ cutlery in tip-top shape for all of the slicing, dicing, and mincing that comes with holiday food preparation. 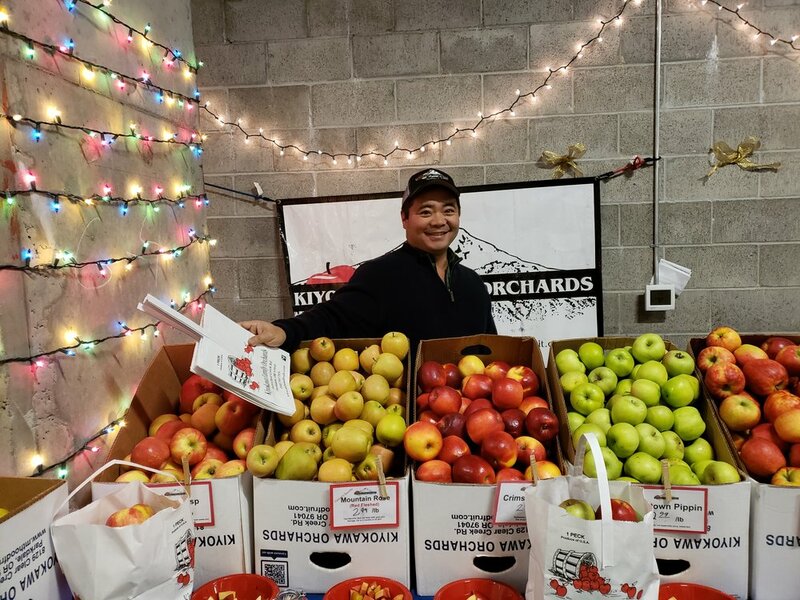 Randy, the owner of Kiyokawa Family Orchards, with his amazing array of apples. How Sweet It Is introduced their new chocolate covered cherries and sold gorgeous gourmet gift baskets for attendees. 2 Towns Cider brought many of their seasonal ciders, like the super fruity and refreshing Boysenbarrel. Crooked Furrow Farm had farm fresh eggs, frozen lamb, and plenty of winter veggies!